The AAA Foundation for Safety reports that debris in the road accounted for more than 200,000 accidents reported to law enforcement from 2011 to 2014. Debris also killed more than 500 individuals and injured another 39,000. Given this data, it is vital for all motorists to understand the great danger presented by debris on the road as well as what they can do to avoid these accidents. When accidents of this nature occur and another party is responsible, contact an experienced accident attorney who will fight for the compensation you deserve for your resulting injuries. What are Common Types of Road Debris? Chemical spills: One of the deadliest and most common types of debris that spill from trucks includes chemicals or fuel. In some cases, chemicals or fuel empty out onto the road from trucks after rollovers or collisions. These accidents can significantly endanger the lives of motor vehicle operators as well as cause serious damage to the environment. Construction-related debris: When there is construction going on, there is a high likelihood of construction-related debris falling into the road. If objects like steel beams strike a motorist’s vehicle, the impact can cause rollovers or loss of control accidents to occur. Construction equipment is supposed to be firmly secured to vehicles, but some companies fail to follow these safety measures. Logs or timber: One of the most common types of debris encountered by motorists are logs or timber that fall off of vehicles. It is critical that vehicle operators who travel with logs make sure that their loads are properly secured because when these objects come loose, deadly accidents occur. These categories represent just three of the deadliest and most common types of objects that fall from vehicles. There are also many other types of objects that can fall from vehicles and result in deadly and life-changing accidents. The Federal Motor Carrier Safety Administration has created regulations regarding how cargo on commercial motor vehicles must be secured. Failure to follow these regulations has the potential to greatly danger the lives of not just the truck driver but everyone on the road. In commercial truck cases involving falling debris, a skilled accident attorney is often able to argue that the truck driver should be held accountable for damage because the driver failed to follow these regulations. A skilled accident lawyer is also familiar with the various defenses that trucking companies can raise in these situations and will remain committed to making sure that the responsible parties are held accountable for your injuries. If forced to decide between striking an object or swerving, strike the object because swerving is frequently more dangerous. Mentally prepare for falling debris on the road. Anticipating what is 12 to 15 seconds ahead of you on the road will often afford you enough time to respond in these accidents. Whenever possible, try to keep open space on at least one side of your vehicle so that you can quickly respond in case you notice debris. 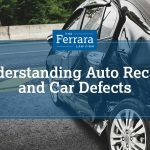 If you or a loved one is injured in a motor vehicle accident and another party is responsible for the resulting damage, you should not hesitate to contact a skilled accident lawyer. 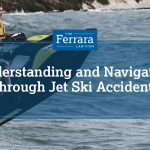 At Ferrara Law, we have helped many people navigate the obstacles that arise in accident lawsuits and know what it takes to make sure that your case resolves in the best possible manner. Contact our law office today.